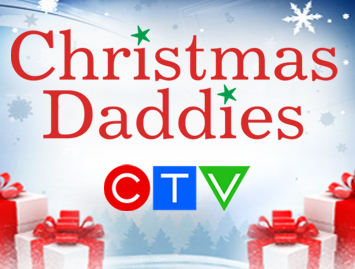 The staff of CTV of Halifax, Moncton and Sydney – along with their families and friends, volunteer to produce the Christmas Daddies Telethon in early December each and every year so Maritime children can have a better Christmas! A Maritime tradition since 1964, the telethon is a pledge-based variety show broadcast live. A cast of hundreds – ranging from the very young to the young at heart – volunteer their time to assist in the television production. Duties include technical set up, taking phone pledges, running auctions and performing on the show. CTV and CTV Two personalities along with invited special guests host the show, and encourage viewers to phone in and make pledges. As well, a large number of individuals, community groups and companies who have initiated their own fundraising efforts appear on the telethon to make cheque presentations. The uniqueness of the Christmas Daddies Telethon is that everyone who participates is a volunteer – from the technical side, to the people in front of the camera and those on the phones. Almost everything from lighting to food is donated by the corporate community. CTV donates airtime and technical equipment to make the production and live broadcast possible. We are one of the longest running telethons in North America. Since the program’s first broadcast in 1964, Christmas Daddies has raised a grand total over $28 million dollars for less fortunate children. Money raised stays in the area from which it came, for example funds donated from Truro to the Christmas Daddies Telethon are returned to the Truro area. Our partner in the distribution of toys, food and clothing is the Salvation Army. Last year alone, our partnership with The Salvation Army provided more than 17,000 Maritime children with toys and gifts at Christmas. The Christmas Daddies Telethon is broadcast from all three stations located in Halifax, Moncton and Sydney – this unique combined program, a volunteer effort by CTV staff, celebrates the roots of Maritime generosity and showcases great Maritime talent from around the region. Donations made to Christmas Daddies are tax deductible and official charitable tax receipts are issued by The Salvation Army. The Telethon is broadcast every year in early December.